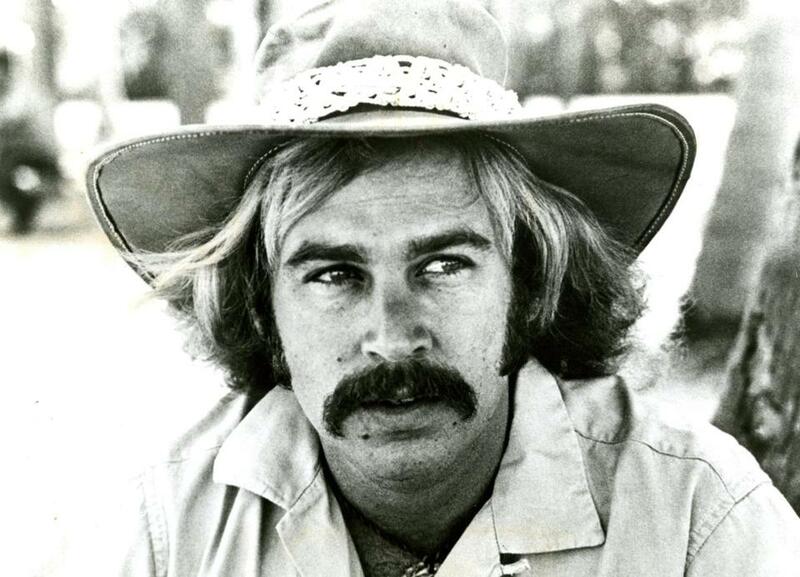 Jimmy Buffett in 1975, just before the album “Changes in Latitudes” became a smash and changed his career — and his music. Right around the time a middle-age woman wearing a coconut bra puked two seats down from me, I made a vow: Never again would I attend a Jimmy Buffett concert. I take that back. Never again would I see Jimmy Buffett in the Boston area, which is one of his biggest markets. It’s also where legions of Parrotheads, the fond nickname for Buffett’s loyal subjects, take over the Comcast Center in Mansfield for a full day of drinking, tailgating, and going wild like they don’t have to work the next morning. That was back in June 2010, at my first and only Buffett show. (Buffett returns to the Comcast Center on Saturday.) That night, as harmless as it ultimately was, stuck with me. It confirmed my theory that Buffett inspires intense love among his fans and sheer disgust in everyone else. Particularly for my generation – I’m 34 – Buffett is a brand more than a musician. 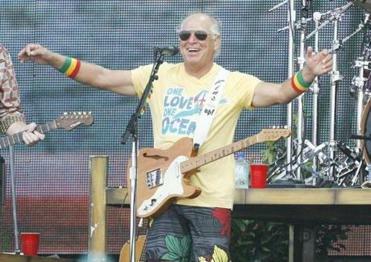 Jimmy Buffett leads his legion of Parrothead fans during a show in 2009 in Alabama. Then something funny started to happen. While digging through crates of vinyl at used record stores, I noticed all these early Buffett records. He looked nothing like the Buffett I saw at Comcast Center, which is to say a tycoon who just retired to Florida. The guy seen on his early album covers reeked of pot smoke, bathed in the ocean, and probably would let you twirl his mustache if you asked nicely. In other words, he was somebody I’d like to party with. Intrigued, I went on a mission: For an entire month, I holed up with Buffett’s first six studio albums, from his 1970 debut, “Down to Earth,” through “Havaña Daydreamin’ ” released six years later. I stopped there because in 1977 Buffett turned a corner with “Changes in Latitudes, Changes in Attitudes.” That was the juggernaut album that gave us “Margaritaville” and the title track, both of which made me ready for a bathroom break when I heard Buffett sing them in Mansfield. A theme emerged almost immediately: This man gets little respect in certain circles. With a Buffett box set and two LPs under my arms, I proudly told the clerk at Cheapo Records in Cambridge I was on a crusade to fall in love with Buffett’s early work, which presented him as a folk-rocker with country leanings. “Good luck with that,” he said, concealing a smile that was really more of a sneer. At 65, Buffett is in a class of musicians whose early work has been overshadowed by what came after it. The newer stuff hasn’t aged as well as the formative repertoire. I constantly tell incredulous friends how great Bette Midler’s first few records were, before Disney movies and “Wind Beneath My Wings” took hold. I maintain that Elton John’s early ’70s albums – “Tumbleweed Connection,” “Madman Across the Water,” and “Honky Château” — are undeniable classics. Honest. Another friend’s jaw dropped recently when I played Cher’s “3614 Jackson Highway,” her 1969 blue-eyed soul sessions recorded at Muscle Shoals. And it’s a long drop from Billy Joel’s “She’s Got a Way” to “The River of Dreams” in 1993. “High Cumberland Jubilee” was recorded in 1971 but shelved until 1976. Buffett ramped up the country-rock and charged hard like something Gram Parsons would have released. “God Don’t Own a Car” was the first time I had heard banjo and trombone on a Buffett tune. I was sold. “Living and Dying in ¾ Time” appeared in 1974 and yielded a handful of fan favorites that still routinely turn up in Buffett’s set lists: “Come Monday,” “Pencil Thin Mustache,” “The Wino and I Know.” Before I heard any of them, I knew I would like the spirit of the album. The cover photo featured Buffett, all scraggly blond locks and cut-off shorts, perched on a rickety boat that was going under. The name of the boat? “Good Luck.” That’s my kind of black humor. (How telling that by 1978, after he struck pay dirt with “Changes in Latitudes . . .,” Buffett appeared on the cover of “Son of a Son of a Sailor” decked out like a grinning, blue-blooded yachtsman.) And did Buffett just drop the F-bomb on “West Nashville Grand Ballroom Gown”? He did. That same year Buffett put out “A1A,” which seems to get lost in his discography. “A Pirate Looks at Forty” came from this one, but the album stood out for its unabashed country twang. “Door Number Three” could have and should have been a hit for someone like Merle Haggard. By the time I got to 1976’s “Havaña Daydreamin’, ” it was clear Buffett’s island shtick was already setting in. From the name of the album to the little tinges of tropical instrumentation sprinkled throughout, the mayor of Margaritaville was lying in wait. Still, there were moments of quiet grace. A cover of Jesse Winchester’s “Defying Gravity” ranks among the most haunting performances Buffett has ever captured on record. Buffett’s publicist declined my request to talk with him for this story. I suspect Buffett still holds those first few albums in high esteem and certainly still performs songs from them. But I’d love to know if he feels boxed in by the persona he so eagerly built around good-time tunes about island escapism, which is alive and well in country singers such as Kenny Chesney. Would Buffett the down-and-out troubadour from yesteryear rub greasy elbows with Buffett the savvy, millionaire businessman? And yet he did exactly that, with a band and his signature party anthems intact. Sure, he sang with folk duo Gillian Welch and David Rawlings, whose “Elvis Presley Blues” Buffett had covered on his 2006 album, and Buffett also nodded to Dylan with an acoustic encore of “Blowin’ in the Wind.” Otherwise, it was Parrothead business as usual. Interestingly, outside of those early records, the only other one that has resonated with me is Buffett’s most recent release. “Buffet Hotel,” from 2009, had a few moments of inspired songwriting reminiscent of his beginnings. “We Learned to Be Cool From You” and “Life Short Call Now” brought Buffett full circle. They’re the kind of evergreen songs I’d gladly sing along with in a sea of Parrotheads. I just ask that no one in a coconut bra vomits beside me.